Preserve that Hole in One Shot Forever. 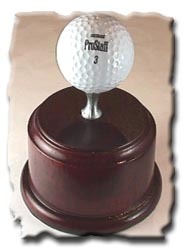 Imagine your cherished hole in one golf ball fittingly mounted on the tee peg of your choice for you to proudly display. This fitting award of your hole in one achievement has been individually hand-crafted by our artisan craftsman Mark Elliott at his studio in Sheffield. The precious metal items all bear his makers mark and that of the world famous Sheffield Assay Office synonymous for quality. 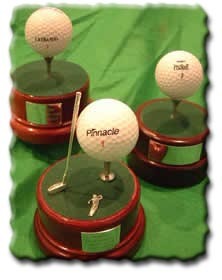 Every piece will have an engraved plaque with your name, venue, yardage, hole number, club used and date of achievement. A certificate personally signed by Mark Elliott will accompany each piece. The tees are an exact replica of the regulation standard tees and castle tees and available in Silver Plated, Sterling silver, 9ct Gold and 18ct Gold. Each award has a plaque with the following details engraved on. To purchase a hole in one trophy, please click on the enter shop button.